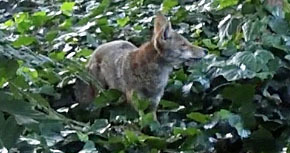 Crossing paths with a coyote in an urban environment is a brief affair — especially if you go on the offensive rather than the defensive. 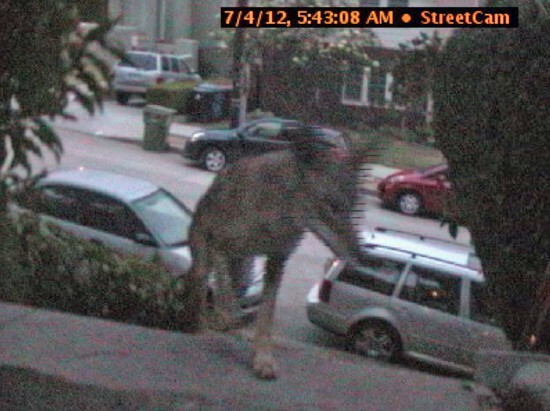 The last thing a coyote’s ever wanted around me is to get into some sort of stand-off as to who’s the dominant opponent. Mainly because I don’t give it the chance by charging and chasing and clapping and yelling at it to reinforce my immediate vicinity as a hazard to its well being. This doesn’t mean I don’t have respect for the coyote — both as a creature with a rightful place in the city; and as the top four-legged predator in the urban food chain. It means I do my part to minimize its habituation to humans. Then there was this morning’s coyote, who was not only a new one on the block (our regular coyotes are a pair and larger), but a whole different animal all together. Returning from our dawn walk with Ranger, Susan and I heard some serious rustling in the neighbor’s ivy next to our garage and weren’t too surprised to find what looked to be a relatively young specimen. The surprise to me was that though it was well aware of our proximity, it was in absolutely no hurry to get away from us in large part because it soon became clear that it had a food item that it wasn’t interested in abandoning. Since the smell of whatever it was eating indicated some advanced level of decomposition, we decided to leave it alone in hopes it would pick it up and leave with it. The “it” in this case was initially thought to be the remains of a squirrel but later I saw that it was the rear leg and hip of a cat… judging by its condition it was not a recent kill. 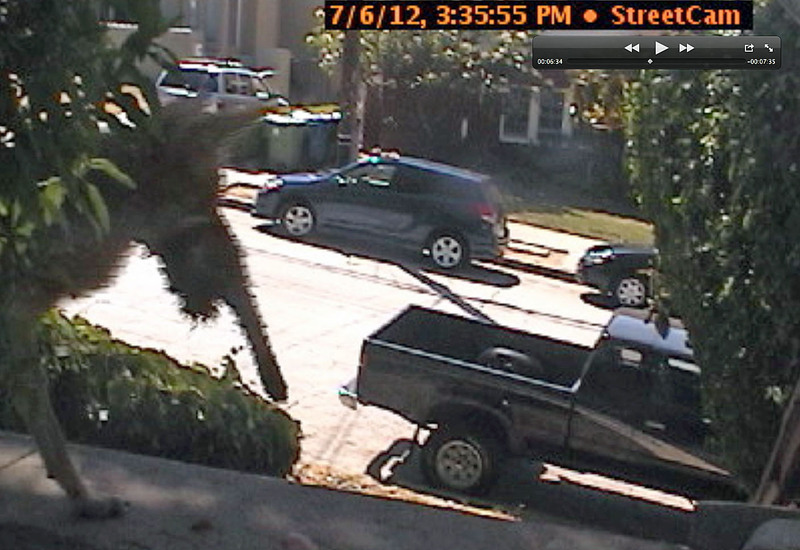 UPDATE (3:03 p.m.): After the jump are three images visiting last week that I just found on our low-resolution front steps cam. The first two shots are from the previously seen pair who paid an early morning July 4 visit. 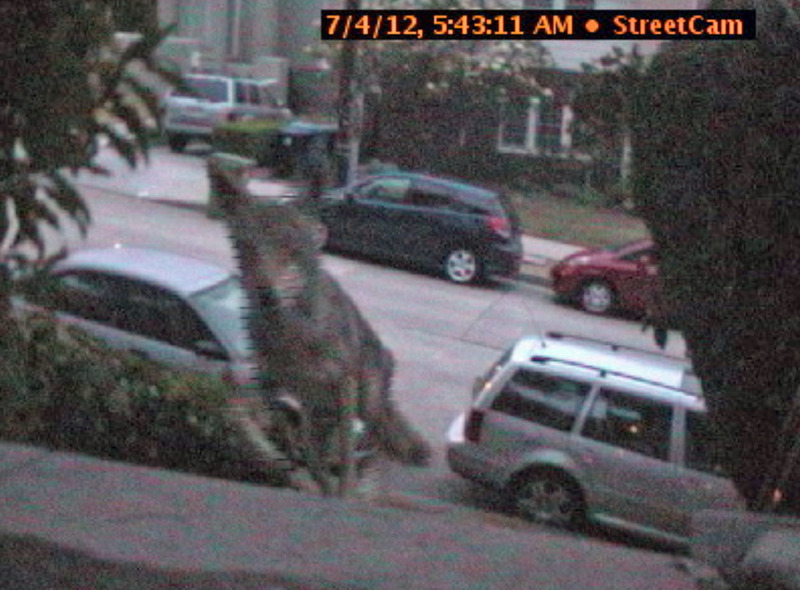 The third still is of a solo coyote (perhaps the same one as encountered this morning) from the late afternoon of July 6 — with a kill (species undetermined… cat maybe?) in its mouth. Dude! This entry was posted on Monday, July 9th, 2012 at 12:20 pm and is filed under adventure, animals, encounters, nature, updated. You can follow any responses to this entry through the RSS 2.0 feed. Both comments and pings are currently closed.